Ceilings that look like floors, staircases that lead to nowhere, and impossible angles and paths that both ascend and descend at the same time are all hallmarks of famed artist MC Escher's architectural drawings - but who knew you could see them in real life? You can if you check out Studio Rolf.fr's intriguing Rotterdam townhouse renovation. All of the surfaces in the house blend together in a way that makes it difficult to discern which way is up and which way is down! 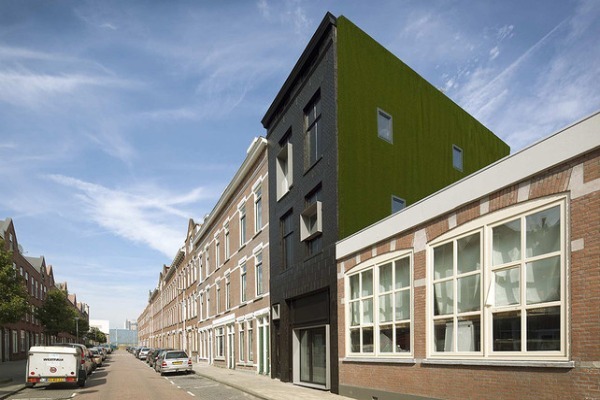 Rolf had help of Zecc Architects in this crazy renovation, and the result is what they're calling the "Black Pearl". In Rotterdam, there is a program where you can buy abandoned buildings for cheap if you promise to renovate them into single family homes. So Rolf decided to buy one to convert into his home and studio. The three story 100 year old rowhouse was gutted completely, leaving a hollow shell with ghosts of its past like an old banister and holes of wooden floor beams in the walls. Then, in the center a large wooden sculpture was constructed to create two levels, space for ducts and pipes and various staircases that lead up to the roof. Named the Black Pearl due to its ominous black exterior, the home leaves behind its old windows, but adds new window boxes to let in light. Handrails, banisters and balustrades are absent from this home, which helps lend the interior its Escher-like qualities. Stairs melt into the ceilings and walls, while holes in the floor confuse the eye. The bottom floor is space for Rolf’s workshop that leads into a backyard with a bamboo garden. The second story provides space for the kitchen and living room and the third floor is a master bedroom. The rooftop greenhouse is used to house a jacuzzi with views of the city. Rolf of Studio Rolf.fr bought this 100 year old rowhouse in Amsterdam and renovated it to evoke a memory of MC Escher's architectural landscapes. The home is named the Black Pearl due to its ominous black exterior, which is strikingly different from the surrounding homes. New modern box windows were cut into the exterior, intersecting with the old windows. The old windows are still visible underneath all the old paint. The old interior was completely gutted to make way for the new interior. Inside, the home is at first strikingly modern, but then it starts to become confusing. 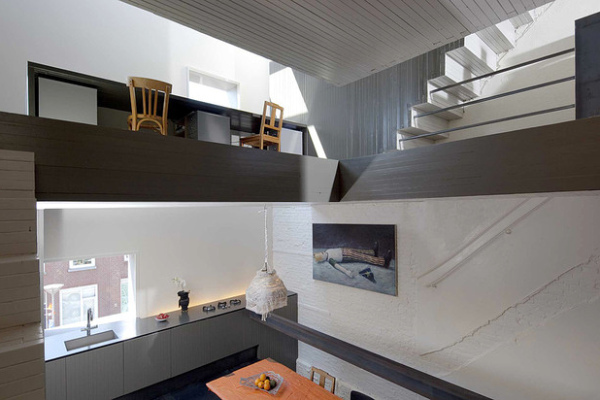 Stairs meld with walls, ceilings and floors. Looking up at stairs from the bottom makes it seem like you're upside down. And ghosts of the past home are still visible in the sides of the building. All unnecessary or redundant staircases, balustrades, balcony fences, banisters and doors have been left out to confuse the eye. Floors, walls, stairs and ceilings fuse and sometimes seem to evoke an 'Escher-like' impossibility. The bottom floor provides space for Rolf's studio and workspace. The work space leads back into a yard behind the house that includes a bamboo garden. The second floor provides space for the kitchen and living room and the third floor is the master suite. Finally the stairs lead up to the roof, where there is a greenhouse and lots of plants. The greenhouse is used to house a jacuzzi. The floorplan of the Black Pearl. Section drawings of the Black Pearl.